The Restless Writers share something very similar: the burning desire to write. And let’s face it, an equally burning desire to escape the familiar. Announcement: we just booked our first-ever literary adventure—beyond the home office! The most common problem writers have is not writing. But this fall, we’re giving a gift to ourselves: a writing retreat. Not a conference where our time is allocated to instruction, awkward introductions, and scheduled meals, but private time, where we can connect with our literary vision and avoid the distractions that intrude on a writer’s day. We all have manuscripts on the go and our characters are screaming at us to spend some time with them. We’ll be answering their call from the comfort and privacy of a Bed and Breakfast on the sunny shores of Lake Huron. That is, until we qualify for the Berton House Writers’ Retreat or perhaps Writing Immersion in Sustainable Tuscany or even La Muse in France. Yeah, dream a little writer’s dream, you get the picture. While writing demands solitude and focus, it doesn’t have to mean isolation and deprivation (note to self: it can mean 400 thread count Egyptian cotton sheets). Our upcoming adventure will supply us with an ambience conducive to creativity, plus fellowship and inspiration. Our retreat promises to contribute to a sense of luxury well-being and provide us with the opportunity to learn while propelling us to reach our writing goals—individually and as a critique group. This is new to us and already we’re bursting with ideas for our upcoming retreat. Here’s a good resource if you’re exploring this idea too, the Writing Retreat Guide: a guide to writers retreat centers and events, for writing groups or your own renewal and exploration. Give it a try, and may the time and space to write be yours for the taking! 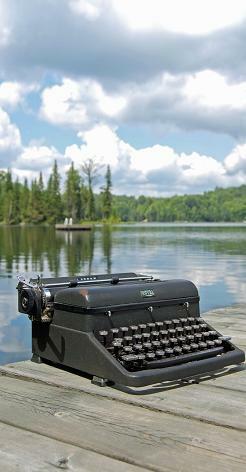 Have YOU experienced a writing retreat? Any advice? We’d love to hear about it! Yay for you guys! Writing retreats are awesome and I’ve been lucky to have done a few with my fellow wordbitches. (private ones of course) have an awesome time! Thanks Trish! We’re mighty excited, even if it’s only for a couple of nights. We’ll have to merge our retreats at some point. How fun! Ha! Like I said….we’ll have to merge our retreats in say, Las Vegas? I’m in. YAY for you girls getting a retreat!! They simply are the best and you all totally deserve it. And yes, merge a retreat? I’m IN! Lori, can’t wait for yet another restless writer/wordbitches crossover! Thanks Elena, and yeah, I bet they are addictive! I’m thinking it might just be an annual event. I was just talking with one of my crit partners about writing retreats! (Like, just hours ago, srsly.) We’re getting antsy. We NEED a writing retreat soon, lol. Hopefully, the right time/place will present itself and we’ll grab the opportunity. Meanwhile, I’ll live vicariously through the restless writers! Enjoy your time away — sounds wonderful! Thanks Shari, yeah, this is a first for us. I fear we may want to do this once a month after we start! Will let you know how it goes. Here’s to big fat wordcounts! What a great idea…..I have had fantasies about time away alone in a cabin by the ocean to write for many years….but I like the idea of doing so with companions, great meals, comfort and wine much better!!! Thanks kp! I know, it sounds amazing right? I can’t wait! We shall post the results here in October.